A book with a sequel before the first one comes out? New York Times best-selling author, Arthur Yorinks wrote a children’s book called Company’s Coming which is not strange in itself. Nor is it strange that the company referred to are space aliens. What’s strange is that a SECOND book, a sequel if you will, is coming out the same day! It turns out these are re-releases that have been out of print for a while and are coming back into stores – hence the same release date. Both books are chapters of the same story, but also can be read as stand-alone tales. However if you read Company’s Going without reading Company’s Coming you’ll be missing something. Mr. Yorinks is an award-winning writer, having won the Caldecott Medal in 1987 for his book Hey, Al and has collaborated with the amazing Maurice Sendak among others. He is one of those rare multi-talented artists who excel at more than one art form. In fact, Mr. Yorinks excels at many including writing, theater, opera, dance, film, and radio – a pretty amazing career. 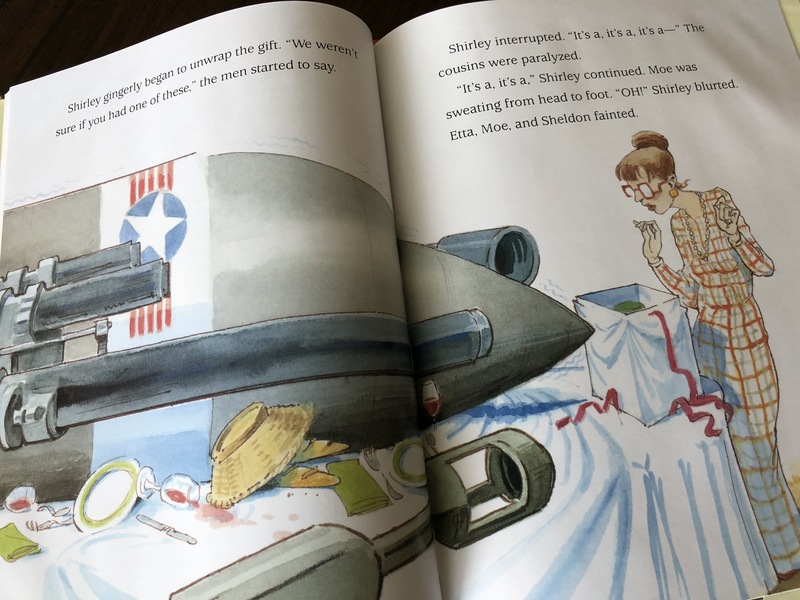 He teems up for both books with illustrator David Small – also a Caldecott Medal Winner and multi-faceted artist – to come up with these two tales. 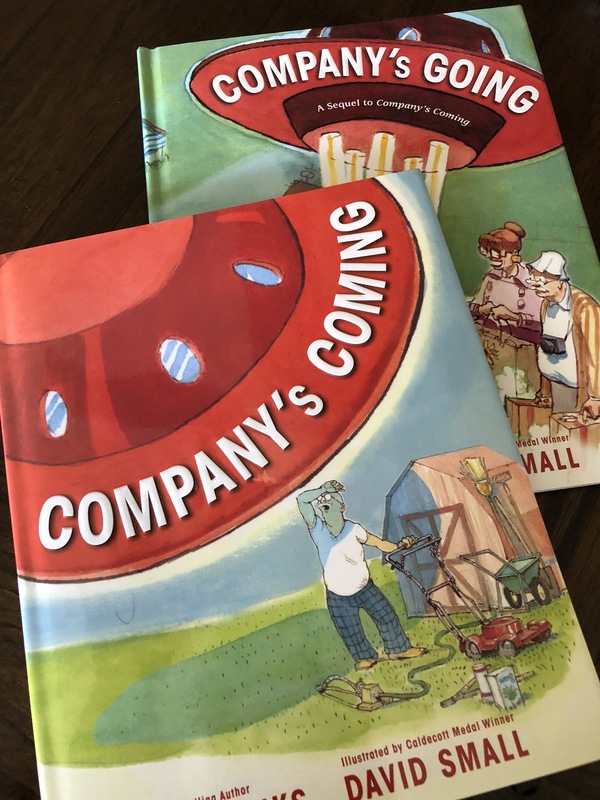 Company’s Coming is about Shirley and Moe, two average, everyday people who happen to be visited by aliens from outer space. When they ask for directions to the bathroom, Shirley immediate responds and welcomes them into her home. Moe, however, is afraid. Shirley offers hospitality and kindness inviting them to dinner while Moe bends to his fears and calls the FBI. In the end, hospitality and kindness wins – on both ends. In Company’s Going, the aliens are returning home and ask Shirley and Moe to accompany them to cater their sister’s wedding. Of course, Shirley in her thoughtfulness agrees while Moe has some trepidation. When they arrive Uncle Irving, an alien with the same feelings as Moe, accidentally stuns them. But undeterred, Shirley and Moe end up catering the best wedding ever. What I love about these books is that they tackle the idea of fear of the unknown and how when we give into fear it can make us behave in ways unkind and unwarranted. Fear leads us to make assumptions that can be harmful to us and those around us, while kindness and an open heart can often make the world (and the galaxy) a better place. Mr. Yorinks handles this complex issue deftly with an engaging story and coupled with Mr. Small’s equally engaging art. David’s art is very expressive and colorful, bringing out in images what Arthur is doing with his words. These two books make wonderful companions for each other and it’s nice not to have to wait to see what happens next. And if you missed these adorable books when they were first released (like apparently I did), at least now you can get a copy if you missed out years ago! Me, either! They are out of print but Disney Hyperion is publishing them again. Should be out now I believe.